This observation of Khuri, that in the history of modern Bahrain the Al Khalifa feel never more threatened than when Sunnis and Shi'is bridge their typical cooperation gap to unite for (or more usually) against one and the same policy, is a lesson that appears several times throughout his still-unrivaled work. 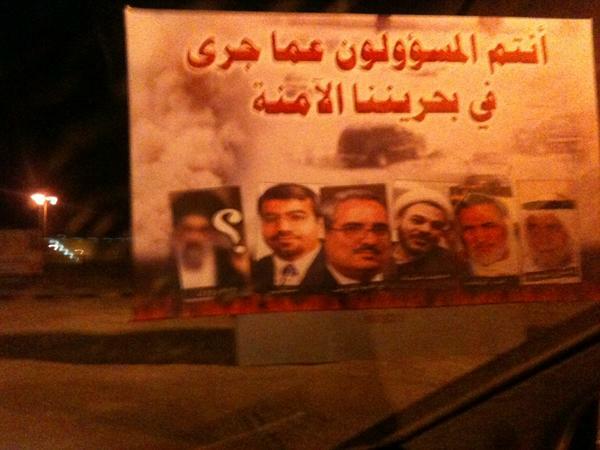 And it is also one that will preface well the discussion here of "the most dangerous men in Bahrain." 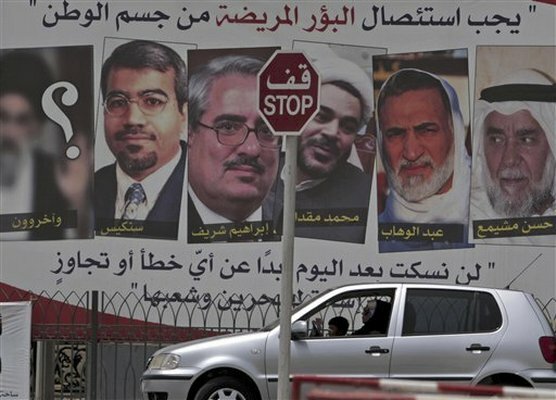 For, from the perspective of the regime, the most dangerous men in Bahrain today are not those one might immediately think of: say, Hasan al-Mushaimi', 'Abd al-Wahhab Hussain, and the other high-level Shi'a opposition figures currently standing trial before military court. No, as far as the ruling family is concerned, the most dangerous sort of person in Bahrain is the one who breaks ranks with the government's Sunni ethnic constituency to join those calling for reform; the one willing to cross the usual Sunni-Shi'i divide for the purposes of political coordination. Hence the authorities' strong reaction to the "No Sunni, No Shi'i--Just Bahraini" campaign, wearers of which paraphernalia were especially targeted for harassment at security checkpoints beginning early on in the unrest. And, even more obviously, hence the speedy arrest and public ostracism of those Sunnis who did play a prominent role in the March demonstrations, particularly in addressing the crowds at the Pearl Roundabout. These include most notably the (now former) Wa'ad leader Ebrahim Sharif, who many saw as the "odd man out" among the political leaders arrested, not only for his being Sunni but also for his leftist political views, which are difficult to square with the portrayal of protesters as Shi'a revolutionaries bent on the installation of an Iranian-style theocratic regime in Bahrain. Sharif especially has been singled out for lambaste by the pro-government camp, which has all but excommunicated him from Sunnism altogether. 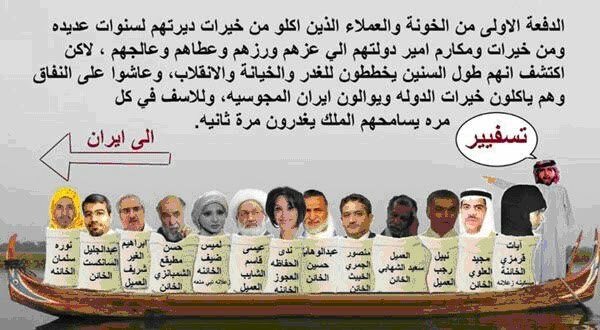 This graphic from a popular Sunni forum, for example, includes him among a large group of Shi'a activists--among them Mansur al-Jamri, Sh. 'Isa Qasim, Nabil Rajab, and 'Abd al-Jalil al-Singace--being shipped "to Iran." Mohamed's speech was meant to reduce the fire going on where people create differences between Shiites and Sunnis. He was there to show there is no difference between them. We are all Bahraini. ... He is not against the royal family and government. Unfortunately, however, such a stance puts him precisely "against the royal family and government," which, as Khuri observed three decades ago, is especially intolerant of social and political groupings that cut across Sunni-Shi'i lines. Arrested on the day of his speech, February 15, Al Bu Flasa had been sentenced to two months imprisonment for "engaging in authorized political activity," "participating in an unauthorized demonstration," and "incitement against the regime." Yet as April 14 neared, his detention was extended another 45 days by the military prosecutor. Al Bu Flasa is now on a hunger strike. Albuflasa's family believes he is being punished because the government wants to reprimand Sunnis who had supported the pro-democracy demonstrations in Manama that were led by the island's Shiite majority. “When Mohamed came to the roundabout, it was like a surprise and a big attack for the government. They thought, ‘How could one of our guys go to the roundabout?’ Now they are making him pay the consequences,” his brother Rashed said. 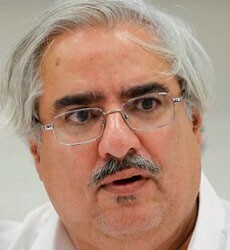 Ebrahim Sharif and Muhammad Al Bu Flasa: two of the most dangerous men in Bahrain. Update: for Arabic readers, a friend points out that the Bahrain Mirror (which is now blocked inside Bahrain) has a very related piece titled "They Are Not Shi'a." Update 2: I just noticed that al-Wifaq has posted the following video slash music video to its YouTube page that opens with about 30 seconds of Ebrahim Sharif's speech at the Pearl Roundabout. I haven't been able to find the entire thing, so this might suffice for those interested.